Princess cut diamonds emerged on the diamond scene in 1980-81 and have since then become one of the more popular diamond cuts in North America. Characterized by its brilliance and sharp, uncut corners, the princess cut diamond has a crown that travels in the vertical direction and has pavilion facets as opposed to the older facets that run in the horizontal direction. A princess cut diamond has straight edges and has a rectangular shape with the best cut proportion being an equal-sided square. The clean edges add to the pristine and wonderful aura of the stone. 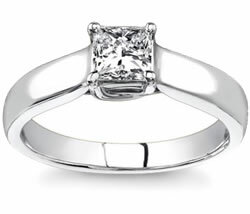 View our princess cut engagement rings here. Princess cut diamond engagement rings vary in pricing and quality. Cheaper than round diamonds, industrial-grade princess cut diamonds can be found for $100 per carat whereas higher-quality ones are around $750 per carat. This variation in pricing allows people with different budgets to purchase a princess cut engagement ring. The brilliance of a princess cut diamond makes it the perfect choice for an engagement ring. Since an engagement ring is something that will be worn for many years it is important to choose a ring that will remain cherished for a lifetime. At Novori, we have thousands of princess cut diamonds via online diamond shopping. Shopping online is quicker than going to the store because you can find a perfect diamond in a matter of seconds and compare prices in the convenience of your own home on your own schedule. After you find the right princess cut engagement ring, you need to choose the perfiect diamond ring setting. Browse through Novori's engagement rings to find the perfect match for your princess diamond. Diamonds have been the symbol of eternal love for hundreds and hundreds of years. By giving your loved one a princess cut engagement ring you are showing her that you want to live in solidarity with her. When you give a woman an engagement ring you are telling her that you love her above all else and you want to be there with her for the rest of your lives. What better way to do this than with a princess cut engagement ring?